I just finished reading Too Much Tuscan Sun: Confessions of a Chianti Tour Guide by Dario Castagno. It is definitely a keeper for my personal library. The author shares humorous stories about his clients (mostly Americans) and his experiences guiding them around the Chianti region. He also writes about living in Tuscany, including discovering wonderful old farm houses and participating in the Palio, a bare back horse race in Sienna that happens every July and August. From the back cover, "With wry humor and affection, Dario recalls some of his more remarkable clients- the delightful, the vain, the silly, the ignorant, the ambitious, the amorous, the condescending, the lovely, and the out-right crazy. He also shares an account of his own life and times- his transformation from bohemian layabout to thriving tour guide- and offers an enchanting introduction to the charms of Tuscany over the course of a year." 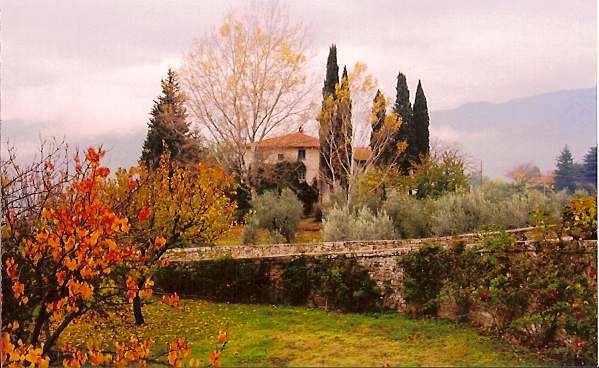 Thank you to Peg Zemke for sharing the beautiful picture from her trip to Italy last fall.